Many, many positive things have already been said on the Internet about Shuffler, a brand new way to discover music on the Web, and we haven’t even gotten around to covering it. Shame on us. Our sincere apologies, but on the upside we now have an excellent excuse to notify you of the awesome service’s existence, as it has gotten some new features today. First things first: what is Shuffler? Cooked up by Amsterdam-based Tone.fm (also see the now deadpooled Twones), it’s a service that essentially aggregates (mostly indie) music from around the Web based on genres. When you visit the homepage, you can pick your favorite genre (from electronic to hip hop and classic rock to ‘Folktronica’) and immediately start listening to a relevant track you probably haven’t ever heard. The service uses Last.fm’s API to assign genres to songs. The sounds come from a great deal of music blogs from across the Web – or basically any site with an RSS feed (WordPress, Typepad, Posterous, Blogger and so on). Tracks can be paused, emailed, tweeted or Facebook-liked from a toolbar that sits on top of your screen after you’ve picked your genre (there are a whole lot to choose from, by the way). From the same toolbar, you can jump to another track from another music blog instantly, or go back to one you’ve listened to before. If you listen to a song until the end, it jumps to another one within the same genre automatically. A menu also lets you cycle through different genres to fit your mood for the day – or the minute, if you will. Needless to say, Shuffler is excellent for music discovery, although depending on how picky you are it might take a while before you come across tracks you actually love. I wish there was a way to bookmark your favorite tracks and access them from a single interface, but other than that it’s a great little product for music lovers like myself. 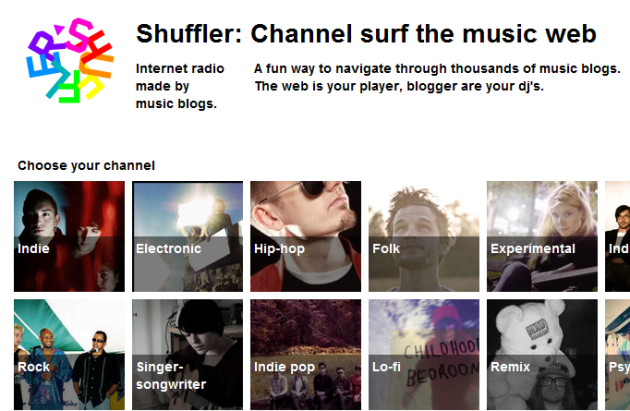 Shuffler maintains a self-reportedly “more or less curated list of blogs”. Upon launching about a month ago, there were some 1,600 blogs in the list, but soliciting users and publishers to flag more blogs for inclusion will grow the list to roughly 2,600 music blogs shortly. That’s a lot of music in aggregate. And starting today, Soundcloud and YouTube have also been added to the list, which Shuffler claims triples the number of music tracks they can serve users. So what else is new? As from today, you can turn a specific blog into a music station – for example, try turning Pitchfork into your channel for the day. Also, some blogs have already started embedding Shuffler channel buttons on their sites, e.g. TSURURADIO (see right sidebar). Shuffler has been bootstrapped by Tone.fm up until now, but the startup does plan to raise some funding for further growth. Right now, they’re working on shipping an iPad app before year’s end (“think of it as a Flipboard for music”), iPhone and Android apps and a premium version with more features. The applications and the premium version is where the money will – hopefully for them – be coming from, but Tone.fm says it will also experiment with advertising.